What I love most about Smoky Row is the caring, nurturing environment. Both of my daughters absolutely love “school” and I know it is because they have such strong relationships with their teachers. The Center’s developmentally appropriate curriculum and philosophy allows for all children to succeed, as well as leaves plenty of room for continued growth. — Gina P.
Smoky Row has provided a wonderful preschool program for our son. His teachers do a great job providing and organizing a variety of educational activities that he enjoys. As working parents picking up a happy and positive child at the end of the day makes our day! We can’t thank the staff enough for all that they do! — Kristen K.
and been given the freedom to have fun. Smoky Row has made our life as parents easier! We highly recommend SRCC to everyone. — Teri and Bret R.
Most importantly SRCC has become a second home to our children who are 4 1/2-year-old twins. In fact, our whole family really feels “at home” there. I feel welcome to be very involved in what is going on in both of my children’s classrooms. All of the teachers have done a fabulous job of building relationship with us as parents as well as with the children. The staff has welcomed us and helped to make our experience very comfortable, happy and an encouraging place for children to learn. 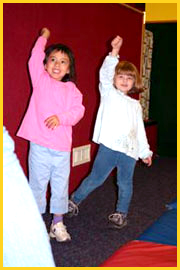 — Nancy G.
We have always appreciated how SRCC emphasizes teaching the children to treat each other with kindness, respect, and tolerance. The teachers and staff at SRCC are top-rate, best in class! — Diane B. Having our children at Smoky Row has been a fabulous experience. The teachers are well trained with a long work history at the Center. 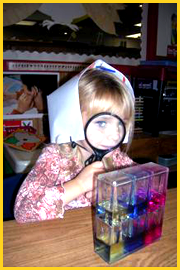 They provide the perfect mix of educational and fun activities. Our children love going to “school” and have become independent, creative and respectful thanks to Smoky Row’s philosophy. We consider the teaching staff an extension of our family. — Karen and Russell H.
We love Smoky Row Children’s Center! Our children are excited every morning to get up and go to “school” In the last six years we have gone to work knowing our children are in good hands. We have always believed it takes a village to raise a child. We are so thankful that SRCC is part of our village.